The time has come...I've been putting it off and putting it off. The backyard is in need of love. Honestly, can you even call it a backyard right now? It's a pile of dirt and weeds. Before we moved in, we had the tiny garage that sat in the area. It was leaning badly and in addition to being ugly, was an insurance risk, so we had it removed as part of our closing. The ground it sat on is, as you can imagine, not the greatest! The area in question is relatively small by Portland standards...and positively TINY by all other standards...around 10' x 30'. As you can see in the images to the left, the area is fairly small, very narrow, and is tightly sandwiched between 3 house. 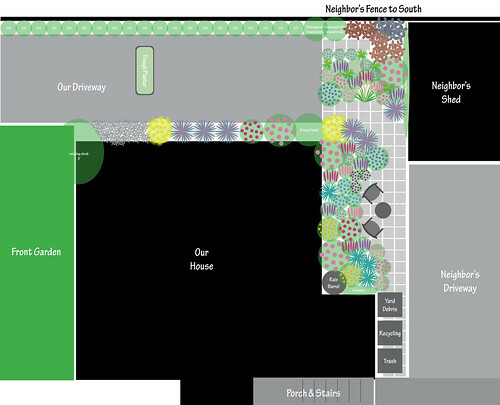 The proximity of the other houses creates areas of deep shade along the south and east portion of the space. The rest actually gets almost full sun, making it pretty much my only full-sun space on the property. The soil is awful and contains a lot of the sod from the rest of the yard. I must admit, I am wholly to blame for the weeds that FLOURISHED back there. The tiny pokeweed that popped up 2 summers ago grew into a miniature forest this summer. I finally chopped down all the remaining stalks this past weekend and disposed of them. I worked all winter to come up with some sort of plan, a jumping-off point. I've made revisions, started over, and actually gave up for a while. The space has proven to be trickier to deal with than I'd anticipated. The long, narrow space and variable light conditions are really tricky to resolve. Below you can see the current plan. It's actually flipped, so the top is south, it's just how I think of the space :-) We would really like to do the hardscape portion first, as most designers will recommend. The main factors are funds and skill...namely a lack of both! We are leaning toward standard red brick, hopefully something used or aged...I always like the look of the aged brick, versus the new-looking brick. Neither of us has ever laid down a path or patio before, so it's going to be a bit of a learning experience. I am considering putting a small fence along our neighbor's drieway to create a tiny bit of privacy in the "sitting area". I'm thinking maybe a few posts with cable running through them covered with a grapevine or some other climber. As far as the pavers go, I'm actually thinking it might be more realistic to plant things this year and follow-up with the hardscape next year or the year after. Hopefully by then, we'll have saved up a bit of $$$ and will have a better idea of what we really want. Honestly, I'm not looking forward to digging up the ground...it's such a mess back there. There is heavy clay and concrete debris from where the old garage was, lots of sod from previous gardening projects, and lots of sand filling in the huge hole where the oil tank was. I'm thinking we might rent a rototiller...or even "GASP" hire someone to till it for us. I know...it's crazy...I've never paid someone to do something I could (technically) do myself. Anyway...that's the boring part...now for the good stuff...the plants!!! 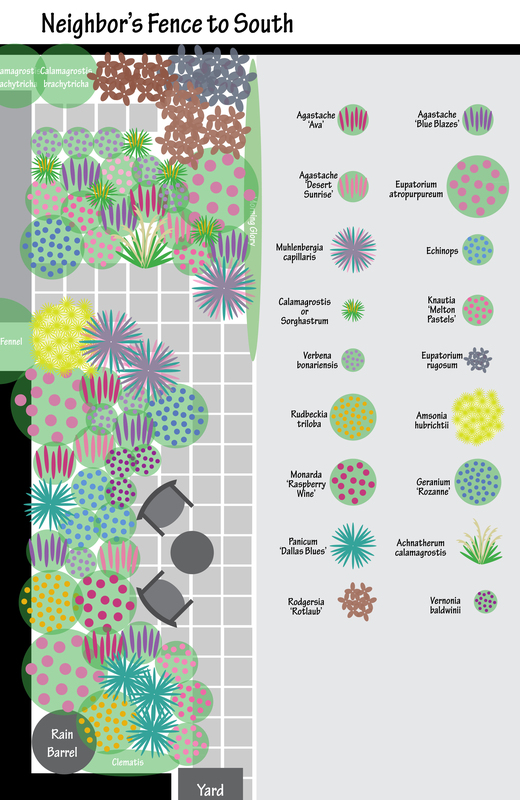 Below is the large version of the plan, showing all the plants. I actually bought all of the Agastaches last fall in a fit of passion (and probably a sale) at High Country Garden's website. At the time, I was intending on doing our parking strips before the back yard, and figured they'd be perfect for a hot, dry spot that might not get as much irrigation as the rest of the garden. After realizing the backyard was more of a priority, I started on plans for it. Since the Agastache are already purchased, everything else was chosen around them. Nothing else is truly set in stone, and I've been exploring many different varieties of plants. I also realize I likely won't be able to afford to plant everything all at once, so will probably plant a bunch of annuals from seed to fill in the gap, I'm guessing things like Cosmos, Gomphrena and Nasturtium. this is quite a plan Scott! Love all the color that will be there during the summer. I might stick a few 'bones' in the mix, some evergreen small shrubs, perhaps? This time of year we have nothing but those 'bones'. Boy the butterflies and hummingbirds will be visiting you a lot! That looks amazing to me. I have trouble visualizing things, and end up just plopping things here and there. Did you use some kind of program to make the symbols for the plants? I had fun looking at them. Some of those plants, I'm not familiar with. Have you heard of lasagna gardening? That may work well for you in your back yard. I am in the mood to take the deck my father-in-law built when he lived here down and replace it with a smaller patio. The ground is not level, though, so it would require more skill than we have. I have been looking at The Small Garden Handbook, but all of those plans look way fancier than anything we could do. Wow! "One little drawing" ha! You've been hard at work thinking, planning and visualizing, I am very impressed. I think you're plan is simply divine and agree you definitely need some privacy from your neighbors driveway. Even if the current neighbor (and their car, and their stuff) is agreeable you never know when they might leave and what you might get stuck with, start planning for that now. And I think you are discounting your skill (and or your partner's skill)...I remember that tile back splash you put in! The pavers/patio/bricks is exactly the same theory only easier (no mortar). You can do it! I can't wait so see the progress shots! So what do you have planned for your driveway beyond the "trough planter?" Oh, one other thing. I am going to post about it later this week but you might want to check out the 40% off sale at Garden Fever. Several perennials and grasses from last season that are looking, well, like it's January. Great deals! Off hand I don't remember anything specifically from your list but if you are willing to deviate you might enjoy checking it out. i think the plan orients itself too much towards the neighbor's driveway. it would make more sense if that driveway was a pond, or some other focal point. also, where are your doors and windows? access and views are pretty critical. i would lean to reversing the plan L and R. hardscape up to the house, and for foundation plantings combine large planters with a few vertical evergreen elements. then rise with the perennial garden to the neighbors driveway. also, with such a long skinny space, i would make the seating section wider. avoid the corridor feel that a 10 wide garden would get. for privacy in that section, i would throw up privacy fence, maybe just 6 feet wide, 6 feet tall along the drive. geez, this is hard to explain in english. i need to draw it out! I find these planting plans very helpful, but mainly just to get all the possibilities in the mind and to get the thought process started. When planting, I always ad lib, but having a plan in mind helps keep it all under control, constrains the impulses to veer to far from plan. To adapt Robert Frost's quip about writing free verse, it's like playing tennis with the net down. Well, Scott, I'm not good at visualizing most things, but I do know my plants (and do know most of what you're planning to plant, and I say...bravo! Lots for pollinators, lots of colour and texture...it's going to be fun to watch you develop this. as eeldip said, mark where the doors and windows are. it looks like the only access is from your driveway on one side and on the other side from your patio/stairs, through your neighbors driveway? Maybe you can move the trash cans so you have your own access from your patio/stairs. I'm still trying to take in all the plant choices so no comment on that yet. It's hard to imagine this narrow space without seeing it. Take some pics and trace the hardscaping idea over the top with tracing paper. I imagine if you put up something for privacy, would you rather sit and look at that or at your house? 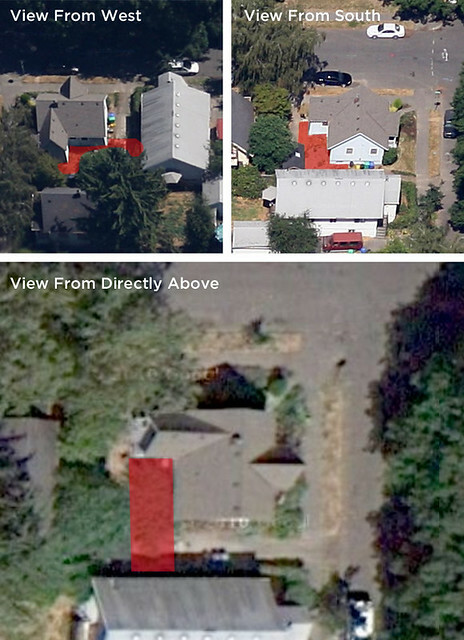 What if you flipped the layout so the planting was a long the property line and the paving was along the house? You don't want plantings too far under the eaves anyways. I'm trying to remember which blog I saw this at, but it was a fence idea for along a property line in a front yard. The fence was short but had taller trellis sections placed at intervals for vines. You could mirror the trellis sections on the other side along the house. as another commentor said: don't forget the bones! I don't know all the plants in your plan, but all the ones i do know are herbaceous perennials and grasses. Make room for a witchhazel or grevillea! I could go on and on with advice based on my own hardscape and fencebuilding experience, but we can talk about that offline. Scott, it's so much fun to plan for a new garden--and yes, so much work, too, but the end results will all be worth it! I have been spending time this winter planning a new garden area, too, and I'm curious about what kind of program you used to create your plan. I have trouble visualizing something in 3-D, so my drawings always look totally different in reality:) Looks like you have a great plan here, and I agree that filling in with annuals this year is a good way to go. It's not only cheaper, but will give you a season to see how everything works and have a better idea of what you need to add. What a beautiful plan! I am always sketching mine by hand and well, I suppose I am the only one able to read it. I agree with some of your other commenters ... flip the plan so you are seated near your house and have a buffer of plantings on the property line, definitely consider lasagna technique (I will never go back), and just a mention - love the rain barrel - but what about a small water feature? Even something as small as a beautiful bird bath or a container water garden. Very exciting - I can't wait to see your progress. I like the plan - the only thing I would do is turn those chairs and table around so that you are facing the flowers instead of the neighbor's driveway. Wow everyone...thanks for all the amazing feedback! Janet: Totally...I really need to focus on the "bones" as you say...I don't know why I am so reticent to put shrubs in. Sue: Thanks! I actually used InDesign, which is a page layout program we use for the Magazine I work for...it's not technically a garden design program, but works as well as any graphics program for measuring and doodling :-) I was all geared up to do the lasagna thing in our parking strip this year (and will next year) but it became evident the back yard needed to be a priority before it got totally out of hand! Good luck with the deck! eeldip: I totally see what you're saying! I will probably continue to revise the plan for the next month or so and will definitely take your advice into account! The windows that look onto the garden are pretty insubstantial...a bathroom window and a bedroom window (which are usually closed) and the kitchen window which is at the North end and will look over the length of the garden. It's a pretty weird little area and the only access is from our driveway and the little path along the house. I'll probably move the seating to on our driveway as it's a little roomier. James: Very much so...it's more of a springboard than anything else...you could look at all the similar plans I've done for other garden areas and there is A LOT of deviation when I get down to the nitty-gritty. Jodi: Thanks! Cross your fingers for me! Ryan: You are the master of fences! That's probably the type of fence i'd like...something very open to grow vines on, but not totally enclose the space...and probably not go all the way to the edge of our house, but leave a little gap. Yeah...access is pretty limited...that's just where we have the bins at the moment...most likely they'd move back to the driveway. I'll have to add the windows to the diagram...but they are pretty inconsequential, except for the kitchen window which overlooks the length of the garden. I think it's an interesting idea to flip it along its axis...I'll definitely have to experiment with that idea for sure. And yes, you've all caught my weakness...I'm bad at choosing shrubs...i have such a hard time giving that much space to something. Therefore, it HAS to be a really great plant...and you read my mind about the Witch Hazel...I've been obsessed with them for the past few years...I just need to find the dwarfiest one possible, hahahaha. Rose: It is a lot of fun, even if I feel like I'm totally getting obsessed at times! I use Adobe InDesign, which isn't really a garden design program...but it's what I'm used to and it's useful for getting a grid and keeping things in scale...which is my biggest weakness when drawing by hand! I just sort of made up the little representation of the plants based on my impressions of them...it's not terribly accurate, horticulturally! VioletFern: That does seem to be the consensus, doesn't it! Hahaha...I guess it just goes to show that it's good to get some outside opinions, sometimes we are just too close to something that we can't see outside the box. I would definitely use the lasagna method if I weren't planting until later (I think you're supposed to let it sit and stew for a while, right), but I already have plants coming in March (or April) so I have to get it plant-ready for this spring...but for my parking strip next year, it's Lasagna all the way! Scott, I love your perennial choices, especially the amsonia, which has gorgeous fall color, and 'Rozanne', which blooms from June into December. I would be slightly wary of Rudbeckia trloba because it seeds everywhere. However, it is easy to remove and gorgeous so I have it planted in a situation similar to yours. I would never plant Eupatorium rugosum in a managed perennial bed though. It seeds everywhere and is extremely difficult to remove because of its root system. Perhaps it behaves differently in OR, but it is native to PA and is a monster (this goes for 'Chocolate' too). Good luck with your plans. I hope we will see photos. Looks like you have a GREAT plan and with the aged red brick...sounds awesome. Scott, I love this. I can't wait to see how it comes along. I'll second the comment about R. triloba, as it is a prolific self seeder and I found it hard to keep up with weeding the seedlings and eventually killed all of them with round-up. I haven't had problems with E. rugsoum 'Chocolate' self-seeding or being difficult to remove. Panicum 'Dallas Blues' has been horribly floppy in every garden I've seen it in around here. 'Dewey Blue' has been somwhat better, but still floppy. 'Heavy Metal' is pretty sturdy. 'Northwind' is the best, but is green. I would think about using a blue conifer. Maybe something weeping that doesn't get huge. Picea abies 'Glauca Pendula', Picea omorika 'Bruns Pendula', a narrow weeping Abies concolor. Or even a dwarf upright like Abies concolor 'Compacta'. Also think about putting one where the E. rugosum is, as an anchor and for tying the two areas together. Carolyn: I've heard that about the Rudbeckia and the Eupatorium…I have both in my front garden (although they've only been there for a year or so…so I'll see if seeding is a big problem. Good to know about the Eupatorium's roots…I'll have to check the existing one this spring to see if it looks too aggressive. Thanks for the heads-up! Grace: You and me both…I can't wait for spring! Plant Geek: Good to know about the Panicum…I've had a really difficult time finding a variety that isn't floppy…and of course, none of the online nurseries are going to say that it's floppy :-( I'll have to check out those conifers…I'm such a noob when it comes to shrubs and the like! 'Northwind' doesn't fall over for me until we start getting heavy snow. It's incredibly sturdy. It's just green, so if you're looking for that blue color it obviously won't work. Plenty of places to visit in OR to see neat conifers. Totally unable to covert plans to reality but it looks most impressive Scott ~ love the planting list. Good luck with it all! It looks like a great plan, plant-wise, and I agree with the comments on reorienting the visual focus. I know every inch of your space is precious, but adding the right shrubs or vertical elements will reward you in structural value. Don't be afraid of laying the brick yourself: I did a simple irregular area roughly 3'x6' myself, by digging out to the depth I wanted, then laying lots of newspaper to discourage weeds (landscape fabric might be better in the long run but I was cheap), then laying the brick flat with a run on its side for the edge, finishing with sand swept and worked in between the bricks. It easily lasted for the ten years we continued to live there. Easy and so rewarding! Looks like a beautiful plan in the making! I love all your agastache and grasses. My only suggestions would be to add some evergreen structural interest for winter, maybe some yuccas? Planting some evergreens in pots would give added height to a narrow space. Also, reversing your scheme in order to plant along the neighbor's drive and put your seating area along your own house might be a more private layout. Congrats on starting the new garden. Have fun! Winter Interest Part II : SNOW!